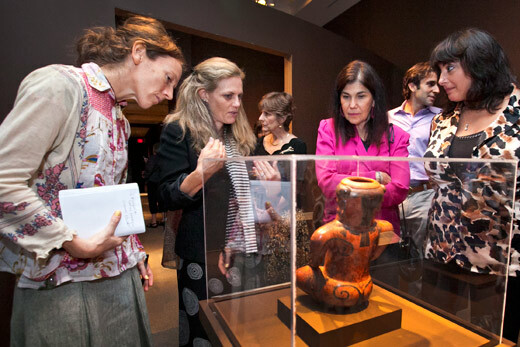 Faculty curator Rebecca Stone (second from left) leads a tour of "'For I am the Black Jaguar': Shamanic Visionary Experience in Ancient American Art," on view through Jan. 5 at the Michael C. Carlos Museum. Emory Photo/Video. Gallery Talk with curator Rebecca Stone, leading visitors through the exhibition and highlighting major themes and objects. Sept. 13, 7:30 p.m.
AntiquiTEA with PhD candidate Meghan Tierney discussing the image of the flying shaman; attendees enjoy tea and scones while listening. Sept. 18, 4 p.m. Cooking demonstration with David Sweeney of The Bakery at Cakes and Ale about quinoa. Registration required; call 404-727-6118. Oct. 23, 7:30 p.m.
AntiquiTEA with PhD candidate Kira Jones discussing psychoactive substances used in ancient American shamanic ritual practice depicted on the works of art. Nov. 13, 4 p.m.
"Finding the Jaguar Within: Psychedelics, the Brain and the Shaman's Journey," a discussion with Katherine MacLean of Johns Hopkins University School of Medicine and Charles Raison of the University of Arizona Department of Psychiatry on what happens in the brain during shamanic trances brought about by ingesting psychoactive substances. Nov. 29, 7:30 p.m.
For more information on all the programs offered and special free days and extended hours, download the exhibition program. Transforming into an animal, taking a journey through a trance, communicating with the spirit-beings and ingesting sacred plants are the ways of the shaman in the ancient Latin American civilizations. The shaman's art and visionary experience is the subject of the fall exhibit at the Michael C. Carlos Museum. "'For I am the Black Jaguar': Shamanic Visionary Experience in Ancient American Art" is on view now through Jan. 5. Admission is free for Emory faculty, staff and students. "It's a very creative type of art in that the objects are not tied to imitation of the world," said art history professor and faculty curator Rebecca Stone, leading a recent tour. "What they're representing isn't truly present here. So that frees the imagination." Based on Stone's 2011 book, "The Jaguar Within: Shamanic Trance in Ancient Central and South American Art," the exhibition contains objects from the museum's permanent collection, "except for a handful," she said. Many of the objects are hundreds of years old, some more than 2,000 years old. They are mainly from ancient Costa Rica and other areas of Mesoamerica, which extended from central Mexico to Honduras and Nicaragua; and from the central Andes. A lot of thoughtful attention has been given to design, placement and grouping of the art. "We purposefully made a design that is a little circuitous, a little bit shocking and different — these galleries have never looked like this. You come in and things are oblique and are kind of going into the distance," she said, referencing the gallery design as a model of the visionary experience. The dark brown background was chosen because "we think it sets off the objects well and because shamanism and these trances take place at night." Quotes from visionaries and shamans are in large type on the walls in each gallery. "We decided to evoke what happens, and then go backwards to how is this accomplished," said Stone. The first area is focused on cats — black jaguars, brown jaguars, ocelots and pumas — because that is one of the main, most important things to turn into. A new piece at the Carlos is a beautiful cathead vessel, which is a portrait of a puma, in excellent condition. Other animal representations include a family of reptiles called crocodilians, deer, praying mantis, the Peruvian pelican, snakes and fantastical animal-like creatures. On display for the very first time is a textile between 800 and 1,000 years old. "It's the top right corner of a larger piece," Stone said, noting that the other parts of this piece are owned by the Metropolitan Museum of Art and the Cleveland Museum. Another grouping shows what happens during trance. One is the sensation of flying. A graduate student's very careful tracings show the detail of the flying figures wrapped around the almost 2,000-year-old pots. The last room "represents how you get into trance," explained Stone. There are musical instruments, illustrations of dancing, and objects that depict and denote stimulants and soporifics, including those that come from animals such as a giant toad and plants, like peyote, coca, spiny oyster and others. The shamans called the substances plant teachers. "Shamanism is the oldest religion in the world," Stone said. "It's considered by historians of religion and sociologists of religions to be the underpinning of all the institutionalized religions ... It is a form of healing as well as a religion."